In the above below, you will see a patient who had undergone hair restoration surgeries in the 90s. This surgery left him with harsh and pluggy looking hairline. He was also left with a bald crown which he wanted to cover up by combing over hair from his hairline, but he could not do so because this would expose its plugginess. Thus, his priority was to soften his hairline for a more natural look so he could grow the hair long enough to comb over and cover the bald crown. Using his already described “FUE Shave Test”, Dr. U was able to determine that this patient qualified for the use of nape hair as a donor source. 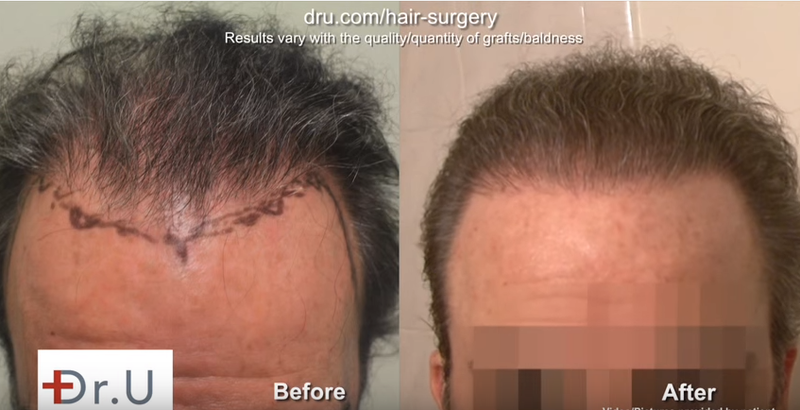 1500 grafts were taken from the back of the head and nape areas to advance his hairline, as well as creating a more natural looking hairline and temple. Because of his radically improved hairline, the patient is now able to comb his hair backwards to cover the bald crown. In doing so, he avoids having to undergo crown restoration surgery and is able to conceal other thinning areas. Undetectable hairline transplant, is it a myth? Thanks, would be more helpful if we know the graft count between nape donor vs regular head donor.